Ready to go for a ride on the Silver line? Metro map. For more information about the Silver line, visit http://silverlinemetro.com/. July 26, 2014 was another milestone day in the history of Reston, VA--the long (very long) anticipated Silver Line Metro opened to the public. It was a beautiful Saturday, and Restonians came out in droves to take their first trip on the Silver line. Some ventured just a few short stops to Tyson's Corner, while others ventured all the way into DC. To me, there are two primary benefits of taking the Silver Line Metro--you don't have to fight traffic and you don't have to look for parking. I may just ride the train one morning simply for the experience of traveling during rush hour without being stuck in gridlock. As someone who lives and works in Reston, I don't have to travel into DC very often...if ever. So I don't. It's not the driving; it's the parking. I just don't want to deal with it. Now with the Metro, that is going to change. 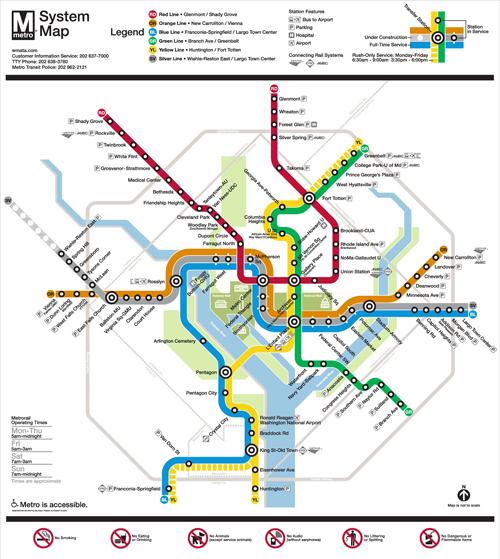 Here are my 5 top Silver Line Metro adventures that don't even require a train change! Eastern Market (Eastern Market stop). http://www.easternmarket-dc.org/ Eastern Market is located in the Capitol Hill neighborhood of DC, and it offers an eclectic mix of fresh food, community events, and local farm-fresh produce and handmade arts and crafts on weekends. It's great fun to meander through the market and have breakfast or lunch at one of the many restaurants in the area. If you want a local's DC experience, this is it. The Smithsonian (Smithsonian stop). http://www.si.edu/ Where to start? The Smithsonian consists of 19 museums and galleries, the National Zoological Park, and nine research facilities. If you are interested in it, there is an exhibit somewhere. From fine art to finery to fossils--you could spend weeks exploring the Smithsonian and see only a fraction of what it has to offer. And now, access is just a short train ride away. The Kennedy Center (Rosslyn stop). http://www.kennedy-center.org/index.cfm This adventure is two for one. The Kennedy Center is such a fantastic resource. From concerts to musicals, there is always something interesting on stage. And even if you aren't there for a show, you'll have a great time wandering the Hall of Flags and enjoying the views from the terrace. However, most people don't realize what a treat walking to the Kennedy Center from Rossyln is. It's a fairly short walk that takes you over the Roosevelt Bridge, which (in my opinion) is one of the most beautiful views of DC. I'm looking forward to heading down on a Sunday for a matinee! Arlington (Clarendon stop). http://clarendon.org/ The Clarendon neighborhood of Arlington is chock full of great restaurants, nightlife, and shopping. If that sounds a little like Reston Town Center, it is. Only it's in Arlington. Clarendon is a fun change of pace if you just want to ride the metro or do something different on a Saturday night. Georgetown (Foggy Bottom stop). http://www.georgetowndc.com/ Georgetown is one of those iconic DC neighborhoods that is just fun to wander around. Visit the famous Exorcist staircase or visit the gorgeous Georgetown University campus and then wander down M Street to find a piece of pie or a cupcake. There is shopping, dining, and great people watching to be found around every corner. A leisurely, agenda-free afternoon in Georgetown is always fun. There are hundreds of adventures awaiting you once the metro train doors open. Enjoy the ride!